Dr. Elaine Scott received both her BSN (’77) and MSN (’91) from the University of North Carolina at Greensboro with a MSN focus in nursing administration. Elaine began her career as a Staff Nurse at Moses Cone, and after practicing for several years found her passion in community nursing. In 1980 she joined Upjohn Health Care Services and in 1985 formed her own company, Community Care, Inc. becoming its first Chief Executive Officer. The company grew and prospered and Elaine sold it in 1996. She then traveled the country as an executive consultant in home health and hospice care. Feeling the pull for something new, Elaine joined the faculty at East Carolina University, and in 2005 became the first graduate of their PhD program. Elaine is an Associate Professor at ECU where she serves as the Director of the East Carolina Center for Nursing Leadership whose mission is to mobilize nurses to be effective partners and leaders in creating healthier communities in eastern North Carolina. She is a prolific writer, having published more than 15 articles in professional journals, is a regular on the national nursing circuit, and highly sought after motivational speaker. She is effective in securing grant funding for innovative nursing research. Her research interests include leadership development, administrative theory and philosophy, polarity management, mentoring, and new graduate nurse transition. 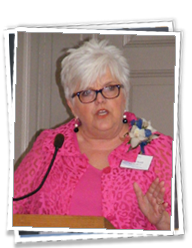 She is currently the President of the National Council of Graduate Educators in Administrative Nursing (CGEAN); the nursing organization that seeks to advance leadership education and research for nurses. Elaine is known by her energy and her passion not only for nursing, but for life. She is the wife of Bill, the mother of two daughters, Sara and Anna, both UNCG graduates, and the human mother for Bogart (her beloved Scottish Terrier), an avid quilter and regular beach comber. She is a true friend, an inspirational colleague, a proud bearer of the UNCG School of Nursing credentials, and highly deserving of this award.